School is starting again for Montrealers! Elementary and high schools gear up this week, CEGEPs are already up and running, and universities kick it off in just days. Whether you’re stocking up on supplies for your kids or for yourself, it's easy to spend lots on colourfully decorated, yet poor quality school supplies. What if there was a list of top quality suppliers located conveniently close by? 1. Montrealer Catherine SoYoung Choi founded SoYoung "to add beauty to the everyday moments of parents' lives by elevating the design of essential items." 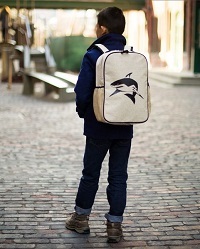 The Toronto-based business makes lifestyle bags and accessories for modern families. Their gorgeous and simply designed eco-friendly, raw linen lunch boxes, backpacks, and other products are a winning combo of quality and convenience! 2. Order SoYoung lunch boxes online, or get them at the Boutique de la Mansarde Bleue! Located just a short 10-minute drive from Rosemont sur le Parc, this quaint Rosemont-La Petite-Patrie shop is proud to support local Quebec and international talent! They’ve got crayons, stylish pencil boxes, cute little accessories like socks, belts, jewellery, and much more. 3. Boutique Ciconia has toys, high quality clothes for children aged 0-10, shoes, and lots more fun stuff. Need new jeans or a fall coat for the young ones? This shop’s got swag from an impressive roster of quality suppliers. Just a 5-minute drive from the Quartier St. Denis and Quartier Rivard condos in the heart of the Plateau. 4. Quincaillerie Hogg is an uncommonly well-stocked hardware store with pens, notebooks, and much more in the way of back-to-school gear. Shop in-store, online, or even by-phone! A 9-minute drive from our new project, L'Alcove sur le Woonerf. 5. Lunch à porter offers a wide variety of stylish and convenient lunch containers, boxes, and accessories. Their lunch gear is easy-to-use, eco-friendly, and much of it is from Japan—home of the original bento box! They’ve got Bentos of all stripes, like this fun Lego design.Or, go for a timeless classic like the stainless steel lunch box. A 13-minute drive from the St. Dominique, and 12 minutes from the Octave! BONUS: Herschel backpacks have been a favourite for years now, and with reason. This design-driven global accessories brand produces quality products that mesh modern functionality with timeless design. Check out these Montreal suppliers.